Natural resource damage assessment and restoration are valuable resource protection tools for NOAA managers to ensure that sanctuary resources are maintained for future generations. Damage assessment is the process of determining the nature, degree and extent of injuries to sanctuary resources and biological services resulting from human-induced impacts. Assessment provides an objective, technical basis for evaluating the need for, type of and scale of restoration actions. Section 312 of the National Marine Sanctuaries Act is a liability provision that authorizes NOAA to seek damages from those responsible for injuring sanctuary resources. The Act directs NOAA to "restore, replace or acquire the equivalent" of injured resources. 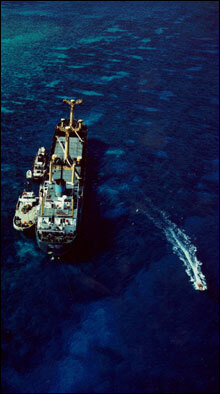 This may mean repairing a coral reef after a grounding or working to restore seabird colonies after an oil spill. As a trustee for sanctuary resources, NOAA can pursue civil action against any person or vessel who destroys or injures sanctuary resources, including a claim for recovery of the costs of response and assessment, restoration of the injured site and compensatory damages. Spills of oil or hazardous substances in the sanctuaries are handled by NOAA's Office of Response and Restoration, in consultation with the National Marine Sanctuary System. The damage assessment and restoration process takes place in three phases: (1.) damage assessment, (2.) restoration and (3.) monitoring. This process is designed to result in determining the need for and scope of feasible, cost-effective and timely restoration of those natural resources and services injured by an incident. NOAA uses an interdisciplinary team of biologists, economists, lawyers and resource managers to assess and recover natural resource damages from those who cause these injuries. The funds collected are then used to implement the restoration project and monitor recovery of the ecosystem. Assessment takes place immediately after an incident occurs. Trained sanctuary field staff use standard protocols to assess the size, type and area of injuries to sanctuary resources. Dependent on the extent of injury and the time horizon for recovery, damages are assessed to compensate the public for the interim loss of the resources until restoration or natural recovery is complete. Restoration is a crucial component in reversing the effects of human environmental harm. The goal of natural resource trustee agencies after an incident is to achieve primary and compensatory restoration. Primary restoration is aimed at accelerating the recovery of an injured resource to its pre-injury or baseline condition. Compensatory restoration compensates the public for the interim loss of the resource from the time the injury occurred until restoration is complete. While the resource is impaired, it is unable to carry out the complete suite of functions on which the ecosystem relies. Compensatory restoration replaces these interim losses by enhancing productivity or access or by providing replacement resources. Monitoring of both primary and compensatory restoration projects is performed to determine whether the restoration goals are being achieved and the site is recovering as anticipated. The restoration monitoring effort allows resource managers to detect and respond to significant changes in the expected rate of recovery, to identify damage to restoration components as a result of external events, such as major storms or vandalism, and to determine how the restoration is recovering in comparison to the surrounding habitat. In addition, the monitoring should be designed to assess the effectiveness of the restoration.